Gun laws should be stricter, according to a majority of the voters surveyed in a new University of Texas/Texas Tribune Poll, but that's only one of several things they blame for recent school shootings. 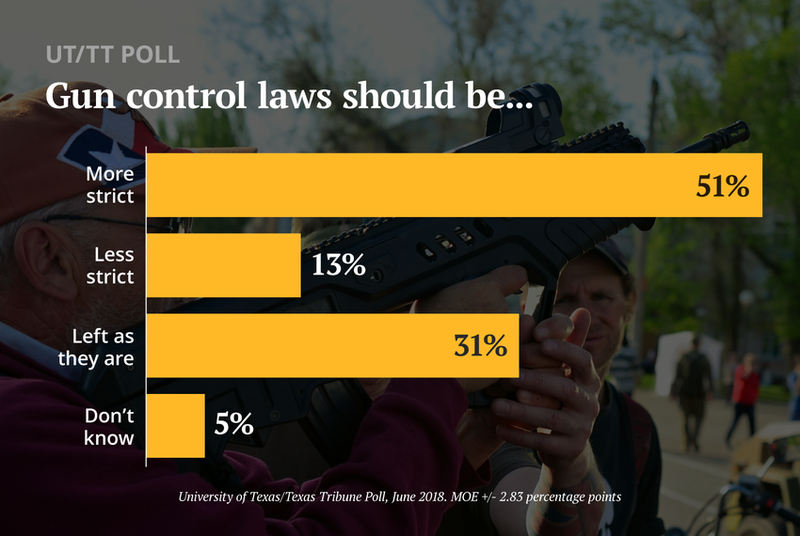 A majority of Texas voters believe gun laws should be more strict, according to the latest University of Texas/Texas Tribune Poll. Almost as many — a total of 44 percent — would leave gun laws as they are now (31 percent) or make them less strict (13 percent). Asked about things that might be responsible for recent school shootings at Santa Fe High School and elsewhere, Texans spread the blame around, checking off insufficient mental health resources for students, bullying, poor parenting, failure to identify potential school shooters in advance, media attention to perpetrators, insufficient security at schools, poor enforcement of existing gun laws, violence in popular culture, insufficient restrictions on gun ownership, drug use and school building design. Asked to choose just one thing to blame, poor parenting rose to the top of the list (18 percent), followed by insufficient restrictions on gun ownership (17 percent), insufficient mental health resources for students (14 percent) and bullying (13 percent). None of the other items were chosen by more than 8 percent of the voters. Drug use and school building design were the first choices of only 1 percent of the respondents. “Among Democrats, the cause is access to guns,” said Jim Henson, who runs the Texas Politics Project at UT-Austin and co-directs the UT/TT Poll. “Equally unsurprising, though striking, is the continuing tendency of Republicans to see the causes in terms of personal breakdowns and individual behavior. “You do see some degree of common ground when it comes to mental health,” he said. Asked what effect more people carrying guns might have, Texans split, with 37 percent saying the United States would be safer and 39 percent saying it would be less safe. Another 15 percent said it would have no effect on safety. Shootings in schools, churches and other public places have changed Texas voters’ minds about the National Rifle Association, but not dramatically: 41 percent said they have a favorable impression of the NRA and 39 percent said they have an unfavorable opinion. In a November 2015 UT/TT Poll, 48 percent had a positive impression and 31 percent had a negative one. The narrowing distance between good and bad impressions hides a wide partisan split, however: In the current poll, 73 percent of Democrats said they have negative impressions of the NRA, while 73 percent of Republicans said they have a positive opinion of that group. There’s a gender gap, too: 34 percent of women and 50 percent of men had favorable impressions of the NRA, while 40 percent of women and 37 percent of men had unfavorable impressions. The University of Texas/Texas Tribune internet survey of 1,200 registered voters was conducted from June 8 to June 17 and has an overall margin of error of +/- 2.83 percentage points. Numbers in charts might not add up to 100 percent because of rounding.